Recently, I was invited to talk about Bundt cakes on Martha Stewart's Serius Radio Show: Everyday Food with Sandy Gluck. As this is a subject dear to my heart, I'm sharing some of my thoughts with those of you who may have missed the show. The word bundt, trademarked by Nordic Ware, comes from the German word meaning group. The original Bundt pan was cast iron and I actually saw it when I visited Nordic Ware in Minneapolis. A woman, coincidentally named Rose Levy, brought it over from Germany! She asked Nordic Ware if they could produce more of these pans and the rest is history. 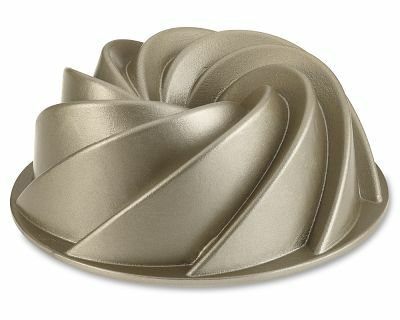 Nordic Ware fluted tube pans, aka Bundt, are made of cast aluminum. The ones I use the most often are the 10-1/2 cup size which comes in innumerable shapes. My top favorite is the Heritage pan with its graceful pinwheel-like swirls. The word Bundt sounds rather heavy so many assume Bundt cakes are dense and weighty. But even a gossamer génoise can be made in this pan. The beauty of the pan is the center tube, which conducts the heat evenly from the center as well as the sides. The center tube also offers extra support making it possible even to use unbleached flour without risking collapse or dipping of the center of the cake. In short, it is a very forgiving pan. Another major advantage of the Bundt pan is the beautiful decorative shape it imprints on the cake making it unnecessary to do anything more in the way of enhancement than a light glaze or sprinkle of powdered sugar or cocoa. When the cake is cut, the fluted edges make a lovely design and the slices can be cut thin and fanned on the plate for a spectacular presentation. Yet another advantage is the depth of the pan if you want to bake a cakethat you can tunnel and fill. Deep pans without center tubes don't bake evenly so a Bundt pan is ideal. Here are a few of my favorite tips for using a Bundt pan to its best advantage: How to prepare the pan: Baker's Joy, which contains grease (lecithin) and flour, is ideal as it enables the cake to unmold with all the fancy designs intact. Spray an even coat into the pan and use a brush to remove any excess. Alternatively, coat the inside of the pan thoroughly with solid vegetable shortening, dust well with flour, preferably Wondra, invert the pan and knock out any excess flour. How to get the most attractive top crust after unmolding: Dollop a third of the batter into the bottom of the pan and use the back of a large spoon to press it well into all the nooks and crannies. Then scrape in the rest of the batter. How much to fill a Bundt pan: Fill it no more than 3/4 full (no more than 1-inch from top). How to turn your favorite cake into a Bundt cake: Most recipes for butter cakes (not sponge cakes) will require 2-1/2 to 3 eggs. In place of 2-1/2 whole eggs you can use 2 eggs and 1 yolk. Another rule of thumb is to use a 2 to 2-1/2 cup flour formula. You can either adjust the recipe mathematically or just use the whole recipe and bake any excess batter as cupcakes. How to prevent a dome from forming in the top of the cake: If you are adapting a cake that is designed for a layer cake pan you should increase the baking powder by about 1/2 teaspoon. This will help to level the cake. The reason it may dome is because the center tube offers more support to the cake's structure, but adding more baking powder will weaken it and result in a more level cake. How long do Bundt cakes usually bake: For recipes requiring a 350˚F/175˚C baking temperature, most cakes bake between 45 to 55 minutes. If using an instant read thermometer it should read between 190˚ to 205˚F/88˚ to 96˚C.